Prepare the lamb leg steak with a meat mallet. Crumb the lamb with the corn flour, eggs and then polenta. Quarter the tomatoes and lightly roast in the oven at 160 degree Celsius for 10 minutes. Turn off the oven and allow them to semi dry for an hour. Place the onion, sugar and vinegar in a pot and cook until the onions are soft and sticky. Add the water and the KNORR Gluten Free Rich Brown Gravy and whisk until boiling. 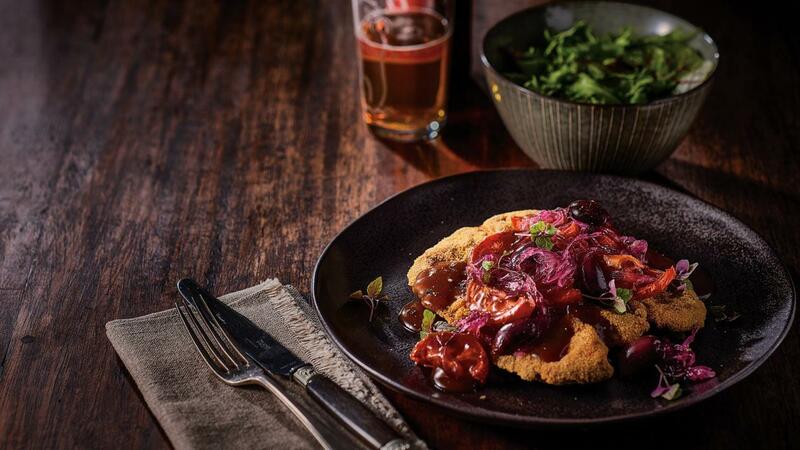 Serve the schnitzel with the tomato, onion jam gravy and olives. Garnish with micro herbs.